Yep, "Ponyville" as in where the ponies live or hang out, in living colour. Hallo fellow Pahlish junkies! Today I’m all up in your side of the screen bringing you the April 2018 Pahlish release known as Ponyville. If you’re a fan of either My Little Pony or flakies that go all kinds of chameleon, you’re going to want to get a cuppa tea and maybe hide your wallet. Pahlish Zecora – Pahlish Ponyville Collection April 2018 (above). Ooooh! Look at that! She reminds me of Chamomile from the Pahlish Afternoon Tea collection except she’s… more. This right here is 3 coats of a marshmallow white that’s fairly jammed full of flakies and other assorted stuffs. Successive coats tend to obscure the glitters a bit so try to do thin coats for maximum show, yes? Or you can use a pair of your finest white undies! Top coat is also a must for these – it pops everything that&apos;s in &apos;em real good. Pahlish Fluttershy – Pahlish Ponyville Collection April 2018 (above). I think I’m probably the only person in the world who stopped at 2 coats with this. Why did I? Because I wanted to keep the softness of it. From arm&apos;s length (where I typically view my polish jobs from b/c I&apos;m not a huge fan of the macro), there’s something really floaty about it in 2. The third coat does erase visible nail lines but I find it also takes away from the delicateness of it. Pahlish Twilight Sparkle – Pahlish Ponyville Collection April 2018 (above). Again, I stopped at 2 coats because that’s what appeals to me. Could I have continued to build it? Sure. But to me, 3 coats kind of kills the sparkle. I’m good with the gauzy sorta dainty that I get in 2 + top. I know, I’m not normal. Pahlish Rainbow Dash – Pahlish Ponyville Collection April 2018 (above). And this one said “Do 3” so I did. They’re thin coats where I tried to lay flakies down while dragging off the colour so I could get max sparkle. It’s fantastically playful; Nick thinks it’d be a cool colour for a bike. He’s so cute. Pahlish Tempest Shadow – Pahlish Ponyville Collection April 2018 (above). This thing is neat! Here it is in 2 coats + top, shot in natural light. It’s violet, it’s greeny-bronze, it’s silvery, and it’s mysterious. Pahlish Tempest Shadow – Pahlish Ponyville April 2018 (above). And if I punch it in the face with my desk lamp, it goes all kinds of goldeny-plummy-grape and has skittery-scattery holo bits! See? Neat! Pahlish Nightmare Moon – Pahlish Ponyville April 2018 (above). Here in 2 coats (+ top) and natural light, it’s another neato! If you go from pinky to middle, you’ll see the shift from turquoise to almost indigo purple. And all those little silver fleckies? They just make this thing look like the night sky. Pahlish Nightmare Moon – artificial light (above). I know, right? Unquestionably cool. You know what else is pretty cool? The Pahlish Desert Bloom Duo. Mmm hmm. 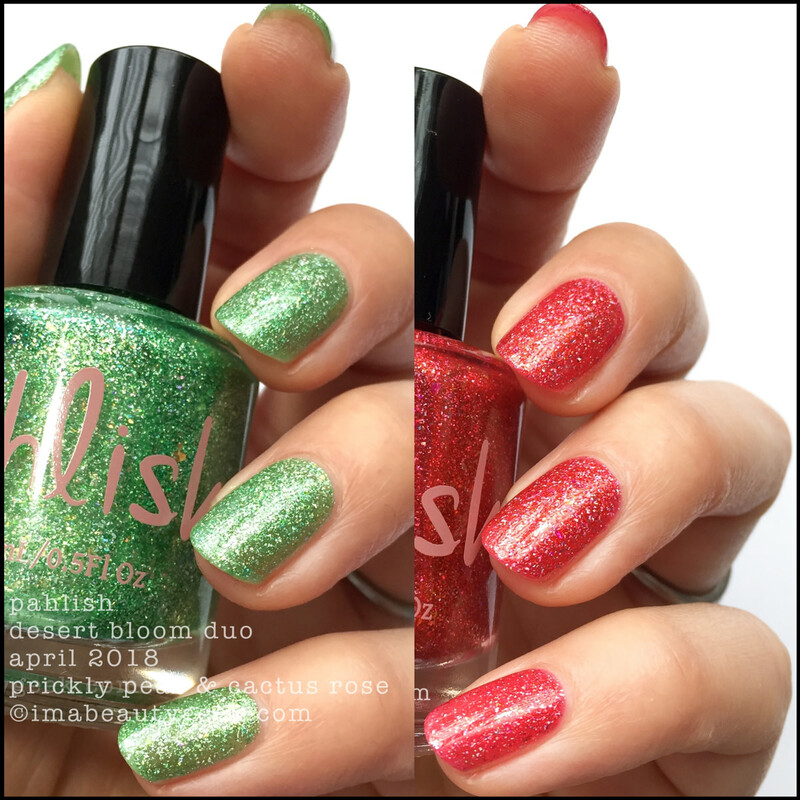 Both collections are available now at pahlish.com & girlybitscosmetics.com. You goin’ shoppin’? Huh? Or maybe you already did? You know I needa know!